Ahhhh, Ragnar week is HERE! I feel that I must introduce y'all to these fabulous sisters in sport, complete with Twitter handles so that you can follow along with all of our shenanigans this Friday and Saturday. Let's start with Van 1 - hey, I'M in van one and, wouldn't ya know, I'm also runner one! I'm freaking out that I'll be starting this party, kickin' it off at 9:30AM with 6.3 miles. If you're curious about all the legs/maps you can check those out here. My second leg will be 4.5 miles around 6:45pm and my last leg will be 3.1 miles around 4:45AM - YIKES. OK, on to the introductions! Runner two is the super awesome Nolana, and hopefully she'll be sharing her PT skillz with us along the journey as well as makin' us laugh; I love her sense of humor. 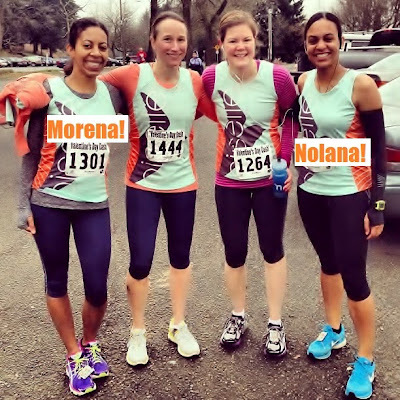 Since I have this awesome picture with both, I'm skipping over to runner four- Morena, who makes up the other half of the Newton sisters - yep, Morena and Nolana are sisters and I always want to say 'the twins' even though they are not! As the moms of the group, Morena, Nolana and I might annoy the hell out of everyone in the van with talk of our chilluns (to make matters worse, Nolana and I both have a 3 and 6 year old) but we'll reel them all back in with book lover talk! 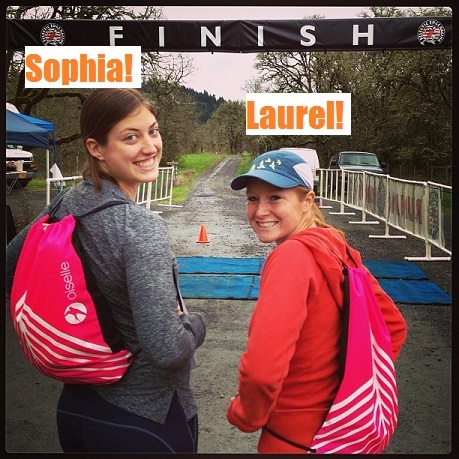 Runner three is none other than my Eugene guardian angel (and our runner representin' Oiselle HQ) Lauren. This girl and I have already established that we can hang in tight quarters for extended periods of time, and we have a lot in common, especially our love of SLEEEEEEP - so BEWARE y'all. 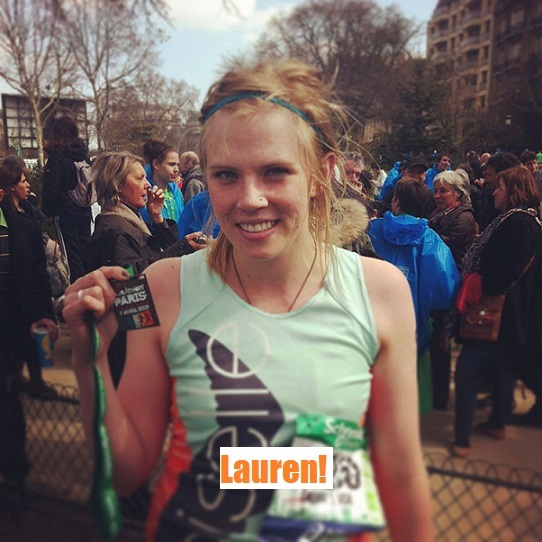 From Lauren's Oiselle Blog post on the Paris Marathon - yes, Paris. 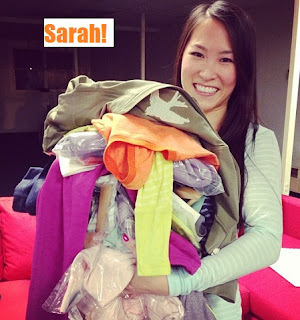 Runner five is the always smiling Sarah with the unflappable sunny disposition. I think we're all going to be relying heavily on her to keep us going when the going gets tough. That and we'll be borrowing any Oiselle items we might need, because she has them ALL. 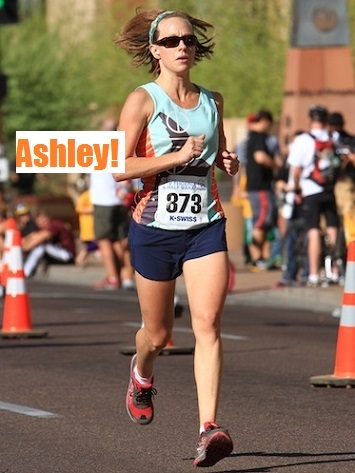 Runner six is the comeback kid Becky who's returning from injury like a conquering hero. Like Sarah, she's always has a smile and apparently only gets 3-4 hours of sleep a night anyway, so she'll be the brains of the operation, I'm sure. I think I speak for everyone when I say that I reaaaally wish we could bring her dog Yogi along as our mascot. You should follow his Instagram account here. From Becky's Instagram: sidelined at Eugene, but there to support us all - including her BFF Sarah running in the Oiselle bridal dress just weeks before her wedding! 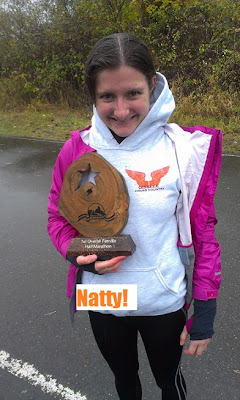 And in van 2, runner seven is one of the most encouraging and awesome cheerleaders of the Oiselle team - Natty. I'm sure she'll keep Van 2 chatting away, she's a great car companion; I was lucky enough to be her race sherpa for when she won the Snohomish River Run. Yeah, this girl is FAST. With her award for winning the Snohomish River Run Half Marathon in 1:24:59! Runner eight is our Hail Mary, Julie, who acquiesced to our last minute begging to join the team and we're so lucky to have her. She's a teacher at an all girls school, so I'm guessing she's got some tricks up her sleeves to keep everyone in line and on task. Runner nine is the one person on our Ragnar team who I have not had the pleasure of meeting yet! Ashley, a fellow momma, is a run coach who made the top ten for the much coveted Run Westin concierge gig which you can read more about here. Very cool beans. 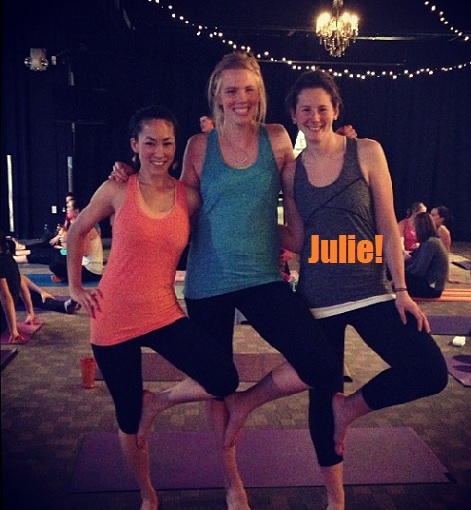 One of many Oiselle Lookbook pics these two put together! Sophia who is runner twelve (yes I'm skipping again) who I was so glad to hang out with in Eugene. She is so sweet and cool, as is her boyfriend who will also be part of van 2 as the driver - lucky ladies! 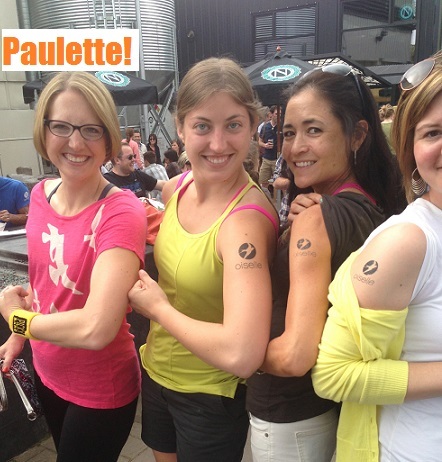 And last, but certainly not least, is runner eleven: our fearless leader Paulette! 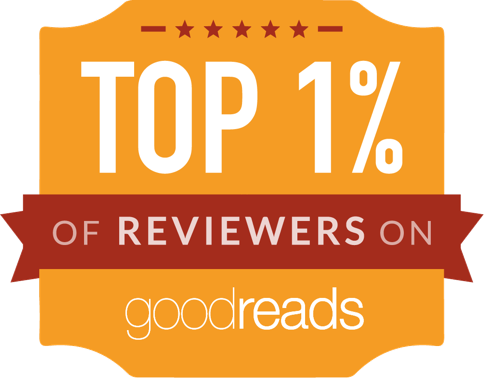 We would not be doing this without her energy and organizational powers. I mean, I thought I was an organized person! Clearly I'm in a completely different league. Is this what happens when you work at Google? By the by, you can spot her (and her car, apparently) making the cut as an extra in The Intern. Thank you, thank you, thank you Paulette for getting this ragtag bunch together and keeping us all organized. One of my favorite pics from Eugene - yep, that's Sophia again and teammate Patty who had to drop out of the team. Next time Patty! Also! 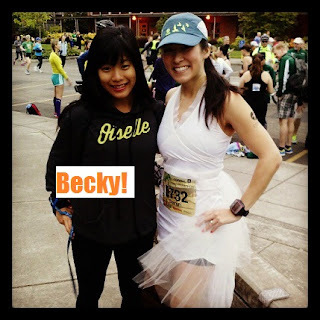 Be on the lookout for our Seattle runner buddies doing Ragnar Northwest Passage as an ULTRA. Six Pack with Racks! Umm, you are THE best at putting together these posts! Totally retweeting. thx Sarah - can't wait for our adventure to begin! you guys will do awesome - can't wait to see you at the start! Good luck, ladies! Excited for you! This sounds so fun! Very cool that Oiselle brought you ladies together. Enjoy it! You're going to have the time of your life! So excited for you girls! Enjoy every second! Fly birdies!